This Spring, there was an update to Kaltura MediaSpace to make login compatible between myFSCJ and Blackboard. This resolved the issue of being unable to access MediaSpace content from Blackboard. 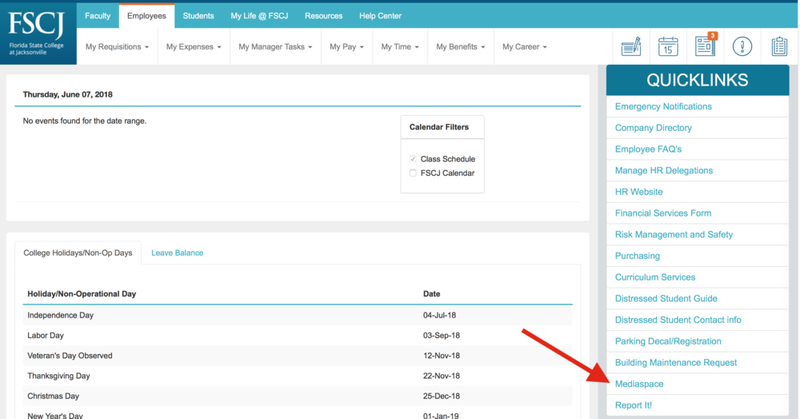 MediaSpace can now be accessed from myFSCJ within the Faculty, Employees or Students tabs, shown below, as well as within Blackboard via a Building Block. If you experience any issues accessing or viewing content that was created within MediaSpace prior to the Spring update, please submit a ticket at help.fscj.edu which will be routed to our MediaSpace administrator who can correct many outlying issues. 1. Log onto MediaSpace and initiate a CaptureSpace recording by selecting “Add New” from the upper right corner. Make a test recording then check to ensure it uploads correctly. 2. Uninstall CaptureSpace using these directions. Try to initiate a CaptureSpace recording in MediaSpace and it will give you the directions to reinstall CaptureSpace. Make a test to verify it works. The video you were trying to upload is probably still on your computer. You can find your previously recorded video by looking for the Settings tab in CaptureSpace. Under settings you’ll see the storage location of the file. Here is a video of the process. Once you have the file you can upload the video to MediaSpace. For clarification, or to ask additional questions, please submit a ticket at help.fscj.edu or email us at EdTech@fscj.edu. The recent transition to PeopleSoft brought many changes with it, including differences in how users upload and embed videos from MediaSpace into Blackboard. Currently, this process has been disabled within Blackboard while IT works out some authentication issues. While the IT department is working with a third-party vendor to ensure resolution, there is an available workaround. Currently, Kaltura MediaSpace still requires users to login by using the old credentials that were used prior to the PeopleSoft transition. In order to access content that was already uploaded into MediaSpace, users are advised to login to Artemis and access MediaSpace via a link in the Technology tab until a similar bridge has been created within myFSCJ. 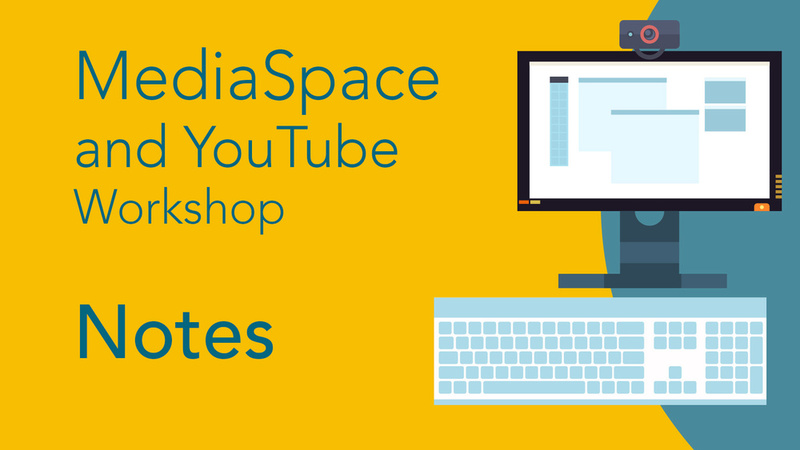 Once a user has logged in to MediaSpace, they can upload, edit, and copy an embed code to use within their Blackboard course to make the content available to students. Once a permanent fix has been tested and is in place, an update will be posted and communicated. If users have any questions about the workaround, please submit a ticket at help.fscj.edu. For more information on adding files, images, audio, and video visit this Blackboard Help article. Should I Use MediaSpace or Youtube? Both platforms work great with Blackboard. Each service has their own strengths and weaknesses. Take a look at the list below to help choose the right service for your video project. Always keep a copy of any video you upload! What Are Some Copyright Guidelines? In the classroom there is a lot of freedom with the fair use of copyrighted material. Using the same material online can be tricky. Here are two resources to help you decide how copyright restrictions may apply to what you post online. How Do I Add Captions to My Videos? Both Kaltura Mediaspace and Youtube support subtitles and captioning. Captioning is not only helpful to many students, it is required by law. A quick web search will reveal many tools to begin creating captioning files for your videos. Here are a few tools to get you started. The software listed below has not been fully tested and reviewed.